Planning a party can be expensive, but hosting an event in your own backyard is a great way to save money and stay within your party budget. No matter what the occasion, theme, or age of your guests, there are plenty of ways to transform your backyard into a magical party venue that is festive and matches your theme. A daytime event is probably the easiest type of outdoor event to host. You don't have to be concerned with setting-up lights or providing a source of heat on chilly nights. There are many different ways to help decorate for a daytime, outdoor event. You can create a scene that perfectly matches your theme by painting an appropriate image on a large white bed sheet. Hang the scene setter on the side of the house or garage. For example, you can paint a picture of a beautiful sunset over a blue ocean to help set the scene for a beach themed party. You can also purchase scene setters from party supply and novelty stores. Oriental Trading Company: You'll find scene setters ranging in price from around $10 to $65. Themed scenes available include sports, tropical, princess, pirates, enchanted forest, and more. Shindigz: Browse through over 150 scene setter options ranging in price from under $10 to around $20. Options include traditional party themes like barn, under the sea, and western, and some more unique options such as a cow print background and individual pieces to create a one-of-a-kind design. Party City: There are plenty of licensed designs available like Disney Princesses, Hello Kitty and Batman, along with adult birthday scene setters as well. There are also some generic options available, all for under $10 each. Tree ornaments aren't just for Christmas time. Deck out trees with strips of fabric or crepe paper streamers and various types of decorations. Tissue paper balls: Create various sized tissue paper balls in festive colors and hang them from tree branches for a perfect party decoration. These tissue paper balls are easy to make, are inexpensive and create a large visual impact. Silk flowers: Add silk flower heads to branches to add color and whimsy to a non-flowering tree. Choose silk flowers in the color and style of the party and use wire to attach them to live trees in the backyard. Picture frames: Hang picture frames from tree branches to add elegance or whimsy. Guests can use empty picture frames as photo booth props or fill the frames with images of the honored person or thematic images. Create a comfortable lounging area where guests can congregate to relax and visit with each other. Tent: A tent provides shelter in case of rain and shade from the sun. A tent also creates a big visual impact and a cozy place where guests can gather to talk. Hang ornaments from the edges of the tent or fill it with helium balloons to create a festive look. Furniture: Think beyond your common patio furniture to create comfortable seating for guests. Bring inside furniture out for a festive and comfortable look. Concerned about soiling your nice sofa? Consider buying inexpensive furniture at a thrift shop and selling the pieces after the soirée. You may also want to consider using a slip cover. Pillows: Many people enjoy lounging under the shade of a large tree. If you have a tree in your backyard, place large cushions and pillows underneath it so guests can sit and chat in comfort. Special consideration should be taken to assure that the food stays clean and safe and is presented in an attractive way. Presentation: Many of the same decorating ideas that work inside will work in an outdoor setting as well, but may require some additional considerations. For instance, use a tablecloth to add a finished look, but use tablecloth clips to keep it from blowing around in the wind. Keep food cool: The sun may cause food to become overheated and unsafe for guests to consume. Keep perishable items inside until just prior to eating and use ice to keep items cool while outside. Use a kiddie swimming pool in the color of style of the party as a large cooler by filling it with ice. Keep food warm: Use slow cookers with lids to keep hot foods warm for the party. Group the warm foods together to keep the cords in one spot, preferably near your outdoor outlet so party-goers don't trip. Keep bugs away: Help to keep bugs away from food by keeping items covered with plastic wrap and lids. Consider using a mesh food cover in party colors to help keep bugs away from food. Seating and tables: Picnic tables are the ideal choice for an outdoor party, as they are built to withstand the weather. Add some comfortable folding camp chairs with tables for overflow. Several of the ideas for a daytime event can also be used in the evening, like having a tent available and setting up a comfortable lounge area. However, there are a lot of additional ways to create a beautiful setting for an evening time event. Lights are probably the most popular way to decorate in the evening and cause the greatest effect. Electric lights: String Christmas lights or outdoor patio lights along deck railings, entries or even on the ground around plants and other shrubs. Be mindful of extension cords as you're placing your lights. Make sure that the lights are operational, and more importantly, that they are not near a water source or where anyone could trip on them or a child can have access to them. 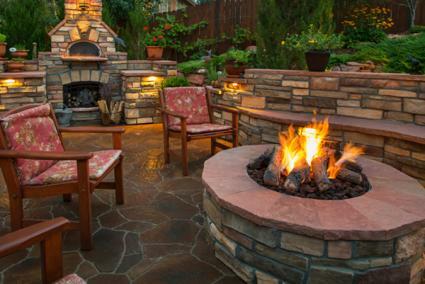 Fire pit: A fire pit is a great way to create an intimate setting for your party. You can use the fire pit, not only as a decorative piece, but also as a practical way for guests to warm-up. You may also want to provide long sticks with marshmallows and graham crackers and others ingredients to create S'mores and other yummy treats. Tiki torches: Use tiki torches to bring a touch of the tropics to your party environment. Extreme caution must be exercised when using open flames, but when used correctly, these torches can be decorative and provide light and heat. Glow sticks: Glow sticks and other lighted toys can be fun in the dark! They can also provide great decoration for an evening party. Create a lighted centerpieces for tables by putting a few good stick into the water of a vase of flowers. Black lights: Install black lights in outside fixtures and sting small strings of black lights in the party area. Encourage guests to wear white and watch them glow. Glow-in-the-dark paint: Use glow-in-the-dark neon paint to create signs and pictures on poster board to hang on fences or against the house or garage. Create messages such as "Happy Birthday", "Happy Retirement" or other themed messages. The food area at an evening event may need particular attention to assure that guests can see what they are doing and eating. Light the way: Use glow sticks, electric candles and other light sources to create interesting lighted centerpieces. Not only with this create an interesting look, but will help so guests will be able to see what they are eating. Tables and seating: Consider using white tablecloths near black lights for a special glowing effect. You may also want to swag tables with battery operated string lights. The backyard is a natural place to host children's parties. Create a custom banner with the name of the child of honor or a special message such as "Happy Birthday." Paper: A simple way to create a banner or bunting is with paper. Use a template to cut shapes or print them from a computer. Simple shapes such as triangles work well, or get creative and cut hearts or another shape. Attach the paper pieces to a piece of string or yard with cellophane tape. Fabric pennant: Use colorful fabric to create a pennant to string from tree to tree or from the deck to the house. Add colorful windsocks and kites to create a sense of whimsy for your backyard party beyond the typical helium balloon. Windsocks: Windsocks are the perfect way to add movement and color to a backyard party. Hang the windsocks from eaves or tree branches and watch them blow in the breeze. Children will love looking as the streamers flap in the wind. Kites: If you have enough wind to fly a kite, provide kites for each guest. Once they are flying in the wind, anchor them to the grass with a kite anchor. Pinwheels: Stick colorful pinwheels into the lawn and let the wind spin them to create a colorful and interesting backyard decoration. 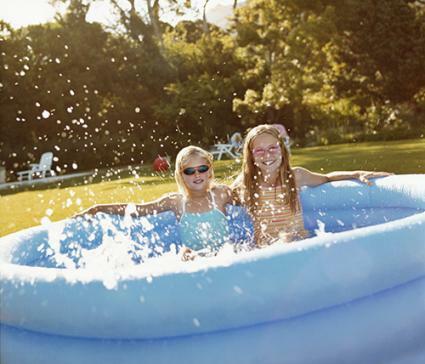 All kids love playing in water, so consider using water to help decorate for a child's backyard birthday party. Kiddy pool: A plastic kiddy pool is a great centerpiece for many themes including tropical, mermaid, pirate and just about any other summer party. Throw in some colorful beach balls or rubber ducks and allow guests to have fun in the water. Water table: Small children will enjoy playing with a water table. If you don't have one, consider setting up a small table with large plastic containers filled with water and water cans, bowls, and other water toys. Not only will this provide a great way to entertain guests, but it can be a focal point of the decorations. Just choose toys that match either the theme or color of your party. Use the key food area to enhance your party theme. Table decorations: Use weighted items for centerpieces as little kids may hang on the table or may bump into it and you do not want to have the items tip over. Balloons make a nice centerpiece, but make sure they are clipped to something with weight so they don't blow away. Tables and seating: Use kid-sized tables and chairs for little guests. Use disposable tablecloths to match the color scheme of the party and be sure to use heavy plates, glasses and flatware so they don't blow away easily. Be sure to check the weather at least a week before your backyard party. 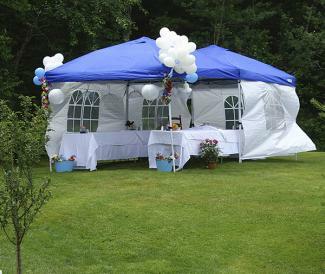 If rain is predicted, consider changing the date or coming up with an alternative plan such as a tent to keep guests dry. If sunny weather is predicted, be sure to provide sunscreen and umbrellas or a tent to keep guests from getting too much sun.